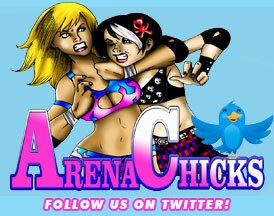 ArenaChicks.com » Blog Archive » Thank You Newark, California! The ArenaChicks would like to thank all the fans that attended “Wrestlefest 2011″ on Saturday, May 21st and the Big Time Wrestling live wrestling event later that evening. We had a great time meeting fans at the convention and had so much fun wrestling in California! Big thanks to Big Time Wrestling for putting together this quality event and we are looking forward to coming back to the next BTW live event on July 15th at the Newark Pavilion. For more info on the upcoming event featuring Carlito Colon and the ArenaChicks visit the BTW website.